Washington, D.C., U.S.A.: American Enterprise Institute for Public Policy Research, 1976. Book. Very Good. Soft cover. Softcover; ex-corporate library; in very good condition. .
American Enterprise Institute for Public Policy Research. Used - Good. Former Library book. Shows some signs of wear, and may have some markings on the inside. DC: American Enterprise for Public Policy Research. Fine. 1976. First Printing. Stapled Wraps. 0844732249 . 37 pages; Fine condition. No creases. Solid, clean. 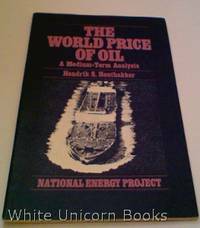 This small booklet offers some conclusions for the problems, asks questions and makes predictions (Outlook for 1985, pg 34) about the World Oil Market. .
American Enterprise Institute for Public Policy Research, 1976. Paperback. Good.